Air plant or tillandsia terrariums are one of the low-cost, low-maintenance versions of keeping plants under glass. 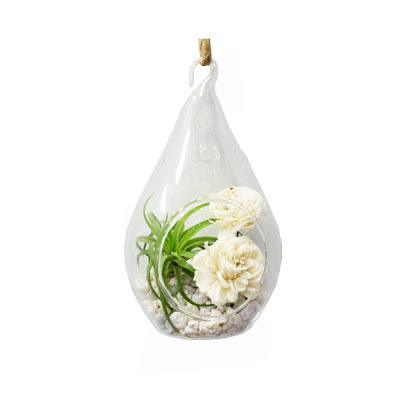 But air plants can get a little boring - why not jazz up your arrangement with some non-plant items? This hanging terrarium from rootsinrust.com also contains some adorable wooden flowers. Gorgeous! This would be perfect for decorating a garden-themed wedding, or used as a really beautiful, unique decoration or gift! I agree! They would be beautiful hanging under cotton umbrellas.